Blog URL: nateraper.wordpress.com – I swear I’ll blog soon! I love a challenge! 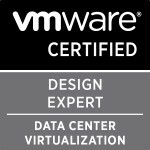 VCDX was a motivation for me, a goal that would help me take my virtualization and datacenter skills deeper. I also saw it as career insurance – a way to differentiate myself in the job market. I think it was some time in mid-2010 that I started exploring the idea of pursuing VCDX. In late 2010 I made up my mind and I started studying in earnest for the DCA exam and took that in early 2011. That’s probably the most difficult exam I’ve ever taken (although VCP2 was no walk in the park either). DCD came later that summer. I stalled a bit at that point because I knew that there was a lot of work that needed to go in to my design and there was uncertainty from VMware whether or not they would hold another VCDX 4 defense. I also had taken a lot of time off from pursuing my Master’s degree and needed to take some classes toward that. When VMware announced that Toronto would be the final shot at VCDX 4, I got busy! So I guess around 18 months, but I certainly didn’t hurry. Do it! I learned a tremendous amount through the process and took myself beyond limits that I thought that I had. Don’t look at the VCDX as a purely technical certification – it’s not. VCDX requires both technical and business skills, so seek peer review of both your submission and your presentation skills. Plan to do several mock defenses with both technical gurus and business leaders – the business leaders may ask more difficult questions and ones that you wouldn’t otherwise prepare for! Study the blueprint, VMware publishes it for a reason. And get support from your family and friends – find a cheerleader to keep you motivated when it’s late at night and you want to give up. VCDX is a long journey and I could not have achieved this without the support of my wife! I would definitely work more on my soft skills and mentally preparing myself. I’m in a position right now that doesn’t require me to be in front of people very often, so my presentation skills had dried up a bit from my consulting days. Above all I would learn to control my nerves better and calm down – I was a nervous wreck during my defense! Well it’s only been a couple of weeks since the results went out…not a lot of time for change, but it has certainly opened up some exciting doors for me. Several folks at my company congratulated me and my boss took me to dinner but I don’t think that many understand the significance of the certification. My reps and contacts at EMC and VMware were all excited and happy for me. Was it worth it? Absolutely! Categories: Certifications, VCAP, VCDX, Virtualisation | Tags: spotlight, VCAP, VCAP5, VCAP5-DCA, VCDX, VCDX4, Virtualisation, virtualization, VMware | Permalink.